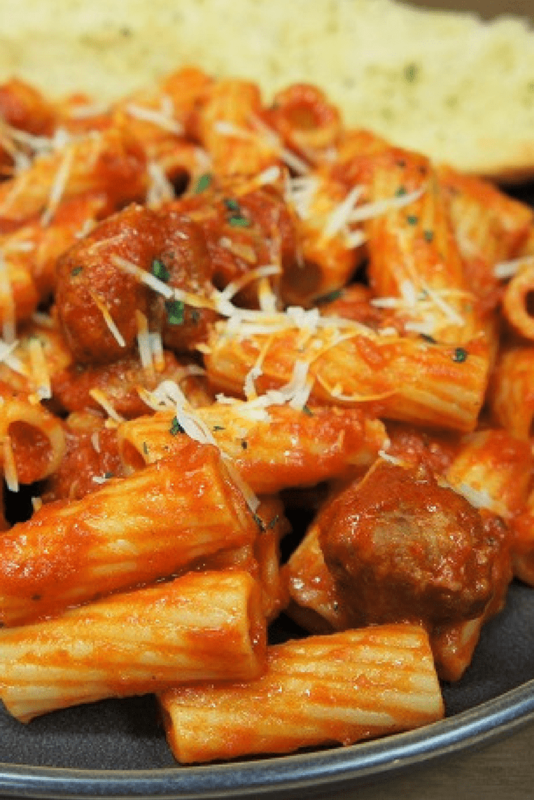 This hot sausage rigatoni is a quick and easy meal that’s great for busy weeknights. 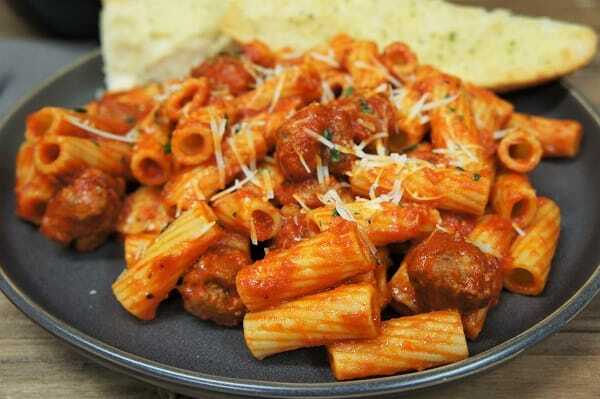 Hot Italian sausage is browned then it’s simmered with pasta sauce. The hot sausage adds a ton of flavor to the sauce, not to mention a spicy kick. 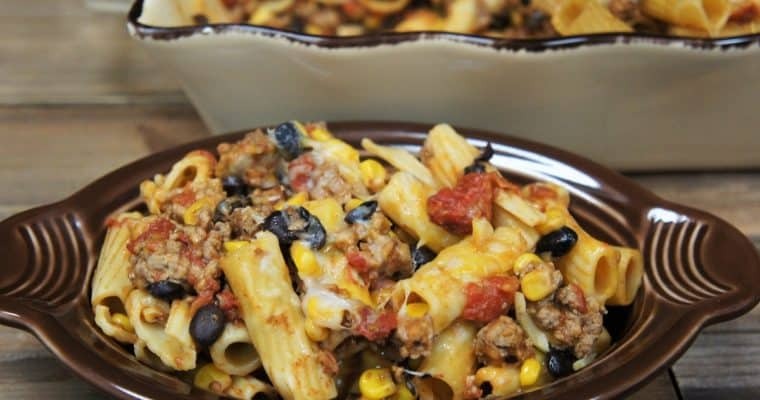 Serve the sauce over rigatoni pasta to make a satisfying, delicious meal your family will love. We go all out with homemade garlic bread and a side Caesar salad. We even used the crusty edges of the bread as the croutons for the salad…so good! I like to use hot sausage in links rather than bulk sausage for this recipe so I can break it up into pieces resembling meatballs. Also, I use a non-stick skillet to cook them so they turn easily to brown and they hold their shape. Remove the sausage from the casings: using a sharp knife tip, run it along the sausage lengthwise just deep enough to tear the casing. Remove the casing and tear the sausage into roughly 1 inch pieces. Repeat with the remaining links. Place the sausage in a bowl or plate and set aside. 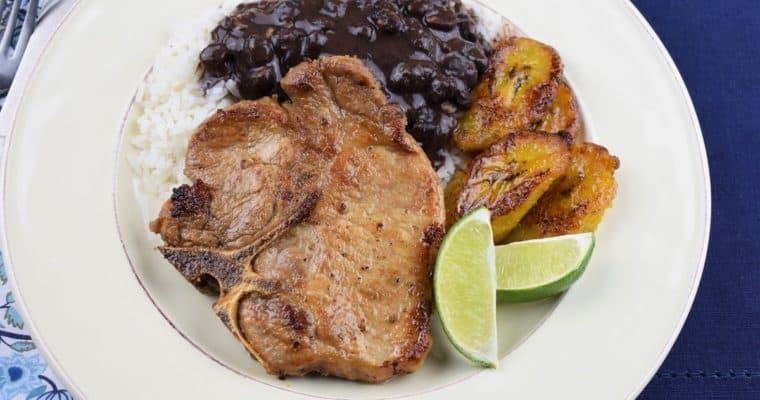 Heat the olive oil in a large, deep, non-stick skillet over medium-high heat. Add the sausage pieces to the skillet and cook 5-6 minutes to brown. Stir or turn the sausage occasionally to brown on all sides. Add the pasta sauce to the skillet, lower the heat to medium-low and cover. Cook the sauce for 25-30 minutes stirring occasionally. Keep the sauce at a simmer, if it’s boiling too vigorously, lower the heat a bit. Bring a large pot of water to a boil. Cook the rigatoni to package directions for al dente. Remember to salt the water. Serve the rigatoni with the sauce, you can either combine them together or serve the sauce over the pasta. Serve the hot sausage rigatoni with Parmesan cheese and garnish with parsley if desired. Enjoy!